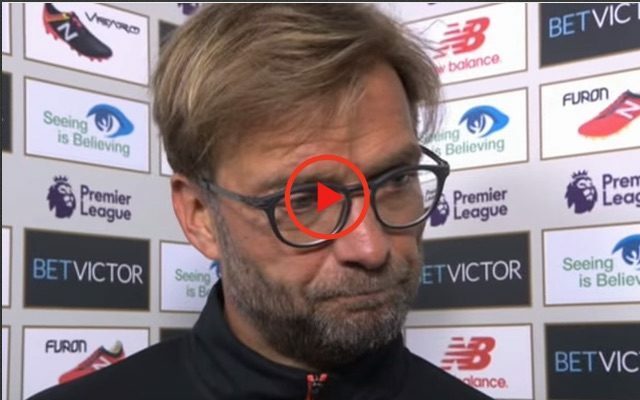 Jurgen Klopp gave a reporter a pretty hard time last night, which in truth, was a little unfair. The journalist asked ‘What went wrong?’ but Liverpool’s manager took offence following the 1-0 defeat to Southampton which saw us knocked out of the EFL Cup at the semi-final stage. “You sat two yards behind me – you saw the game. We didn’t score. We could have scored in the second-half, four or five times. Really what question are we asking? And then the ref, sometimes, it would be really nice [for him to give] obvious handballs. It would be nice,” Klopp said. Last night, fans were as angry as our manager. We had an effort cleared off the line and two very good shouts for a penalty which would have seen us back in the game and likely going on to win, but it wasn’t meant to be. Credit Southampton. At least Sadio Mane is back soon.